When it comes to Dragon Ball Z fighting games, I am one of those people who loves them for the over the top spectacle more than the technical fighting specifics involved. I know when a fighting game feels responsive and plays nicely, but the technical nitty gritty isn’t a huge factor in my love of the game. What I want is to control a bunch of super powerful fighters, blast my enemies into visually spectacular dust and recapture some of that childhood excitement that coarsed through my veins when I first watched the show growing up. Dragon Ball Z: Extreme Butoden on 3DS is a solid fighting game, but somewhat unimpressive in this regard. It’s a competent, responsive fighter, but it plays everything about it’s design a little too safe and bland. So, let’s get the core info out the way. 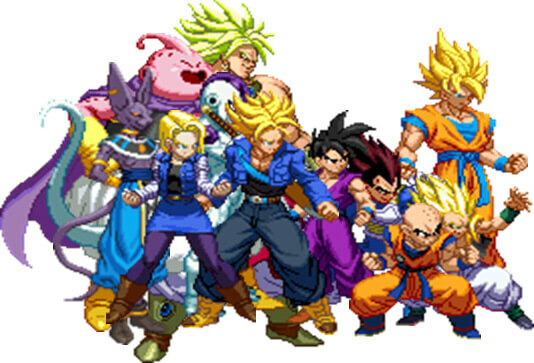 Dragon Ball Z: Extreme Butoden is a 2D sprite brawler for 3DS set in the world of Dragon Ball Z. All playable characters have the same core controls, similar to games like Smash Bros. where the inputs don’t vary, but the moves produced do. Dashes double as teleports into counter positions if timed correctly, while characters string together basic combo strings, ranged projectiles and launchers. You fight each match with a team of characters, built up of mains and non playable assists, with the player able to switch between team characters at any time. Characters mainly vary in terms of plot specific special attacks, power and speed. If all this sounds a bit dry and by the numbers, that’s because that’s how it feels in game. It’s by no means an incompetent fighting game, far from it, but it just plays everything very by the numbers. There’s nothing about the combat that feels particularly new for fighting game fans, or particularly exciting for Dragon Ball Z fans. Visually, Dragon Ball Z: Extreme Butoden has turned out pretty nicely. While not the peak of 2D sprite work, they certainly hold their own with some of the better examples of 2D sprites on the system. Sprites are crisp, expressive and fluid in their animations, which leaves little room for complaint. It is worth noting that with 3D on the system switched on, some of the special attacks do look rather spectacular, with a lot of work clearly put into effective 3D layering. 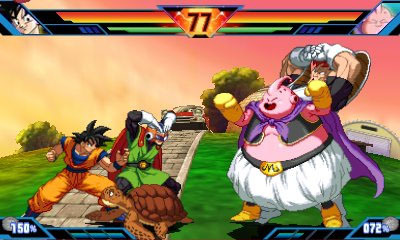 In terms of a story mode, Dragon Ball Z: Extreme Butoden’s initially available story mode sees you play through a truncated version of the events of Dragon Ball Z. Events are skipped over and dialogue is shortened in such a way that a lot of the drama, emotion and investment is stripped away. Much of the engagement with Dragon Ball Z comes from the over the top nature of long, drawn out exposition screams, and that isn’t really replicated here. Imagine the plot of Dragon Ball Z, heavily abridged, and told through mostly still character portraits, lifeless dialogue text and the occasional brief plot related battle that doesn’t go on nearly long enough to justify its build up. It’s a bit of a disappointment. After completing the main story, you do unlock some alternative storylines to play through that offer interessting spins on the narrative, as well as an additional adventure mode that sees Goku face off against many of the enemies from the main story in a slightly contrived narrative. It’s fun to do fight bosses in new combinations, but the narrative attempting to string that together feels like an afterthought developed to excuse the gameplay content. One of the more dissapointing aspects of the game for me was the limited playable roster. While many of your bigger name characters are playable, most of the supporting cast of fighters is relagated to support assit roles. Past Dragon Ball Z games have allowed a very wide selection of characters, down to some of the most useless, to be playable, so this feels like an unfortunate step back. Unlocking these additional assist characters is also a bit of a lengthy chore, as they have to be unlocked by attaining high ranks throughout other modes. Many of these character unlock requirements do not feel like the reward unlocked is really worth the effort put in. 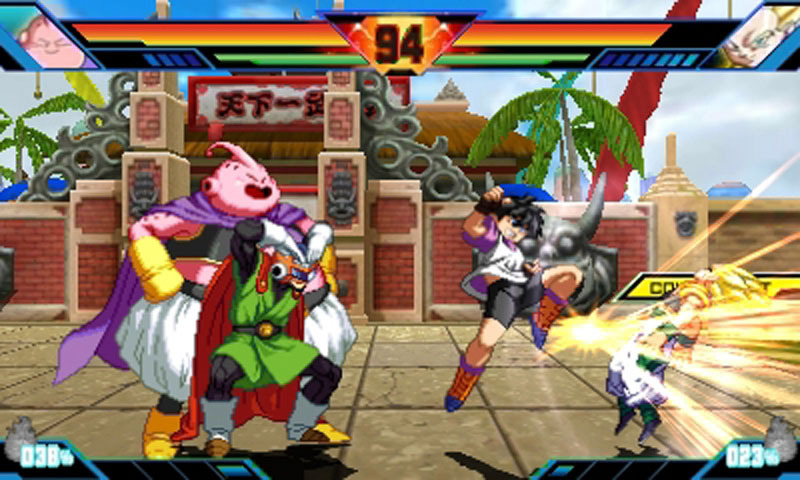 Dragon Ball Z: Extreme Butoden does feature a local multiplayer mode, but unfortunately no online multiplayer. Yeah, if you couldn’t tell from my less than enthused review, I really couldn’t muster up feelings either way on this game. It’s a competent fighter with nice sprite work, but it also does very little interesting with narrative presentation, combat mechanics or gameplay modes. It all feels very safe, and I didn’t really feel much by the ime I was done. Time to scratch my Dragon Ball Z itch with some Budokai Tenkaichi 3.